This week’s author interview is with Leland Ryken. He is the author of our upcoming book, 40 Favorite Hymns on the Christian Life: A Closer Look at Their Spiritual and Poetic Meaning which will release this Friday! I am from humble roots, having grown up on farms in central Iowa. I received all of my education through college in my hometown of Pella, Iowa, and my graduate education at the University of Oregon. I am currently in my fifty-first year of teaching in the English Department at Wheaton College. My wife and I have three children and sixteen grandchildren. How large a role has publishing played in your life? It has been huge. I am known around the world not as a professor but as a writer. When people engage me in small talk, the subject is invariably my writing. I cannot imagine having had a fulfilling life as a teacher only, or as a writer on literary subjects only. When I don’t have a book under way, I feel somewhat at loose ends. As I near the end of my public years, it is obvious to me that my chief contribution to the Kingdom has been publishing. 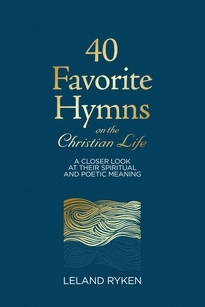 What is the nature of the book your current book 40 Favorite Hymns on the Christian Life? It is an anthology of hymns printed as devotional poems. That in itself would be a great step in getting hymn lovers to experience the familiar hymns in a new and richer way, but it gets even better than that. Each hymn is accompanied by a 500-word literary analysis or explication of the type that I conduct with poems in my literature classes. The effect for my readers will be that they will feel that they have been introduced to hymns they have never known before—not literally, but in the sense that a whole new dimension has opened up. How did an academician become an author? It was all dependent, of course, on having initial success in publishing. But once I started having success, I very consciously decided that I had a writing career as well as a teaching career. It was one of the best decisions of my life. The result is that I never felt constrained to write “in my field.” I have published on a wide array of subjects, and this has given me an entry into many interesting circles. I have entered pretty much every publishing door that has opened before me, and many of the doors have led to modest assignments. In my writing life, I have found that being faithful in little assignments has often qualified me for major writing opportunities later. Has writing become easier as your writing career has unfolded? The process of writing has become more efficient. I accomplish my writing projects faster. I’m not sure the process is easier or less laborious, but it takes less time. Inasmuch as I don’t have quite enough to do when I do not have a writing project under way, my efficiency sometimes has the downside of leaving me without a current writing assignment. Do you have a favorite among your nearly sixty published books? My honest answer is that the book I like best is the one I am currently writing. Although some of my books have been landmark books compared to others, I have learned not to prejudge what my most important books or articles have been. Often it is the seemingly modest or relatively obscure publication that has been the one by which I am known to a given reader, or that a given reader has experienced as a landmark in his or her life. How did you come to write the hymns book? What do you mean when you say a hymn is a poem before it is a hymn? Every poem begins as a written text. This text has the properties of a poem. It is written in lines that end with rhyming words. It employs images and metaphors, and it possesses verbal beauty beyond ordinary prose discourse. This written text becomes a hymn only after it becomes paired with music, and this is always a second step, beyond the merely poetic one. What does a hymn text gain by being printed and pondered as a poem? The first thing we gain by reading a hymn as a poem is that we slow down and give it the attention it deserves. When we sing a hymn, we are hurried along and need to keep moving. When we read, we can take as long to unpack the meanings and verbal beauty as is needed. A second thing that happens is that when the stanzas are printed one after the other in linear fashion, we begin to see the carefully worked-out progression of the poem. We see how each stanza adds something new to the movement, while at the same time being related to the other stanzas and to the unifying element that binds the whole poem together. And of course we can take time to unpack the meanings of individual images and metaphors and allusions, as well as savoring the verbal beauty of the evocative phrases. What did you discover about the forty hymns as a group? The most important thing I discovered is what good poetry the great hymns are. My academic discipline of literature pays lip service to hymns as part of the literary tradition of the English-speaking world, but English teachers never actually explicate hymns in class. I now believe that this is a loss. I also discovered what a gift the great hymn writers have for beautiful phrases and other forms of verbal beauty. I discovered how carefully hymn writers compose on a stanzaic principle, with each stanza having its unique “duty” to perform. Along with that, however, hymn writers are very deliberate about maintaining the coherence of their poems, with everything contributing to the unifying theme and purpose of the hymn as a whole. Finally, even though hymnic poems can be explicated just like the poems I normally teach in my literature courses, they also represent poetry under vows of voluntary renunciation, by which I mean that they are not as complicated and dense with literary technique as ordinary poems. Were there surprises that emerged? There were many surprises. Most hymn writers are extremely prolific, and many of them wrote not only hundreds of hymns but thousands. Many famous hymn writers were ministers or clerics. Many of famous hymns arose of great suffering and tragedy in the lives of the poets. Very few hymns writers have been professional literary people; they were literary amateurs. How, then, were they able to write so many hymnic poems, seemingly spontaneously? My answer is that God’s benediction fell on their efforts. Finally, some famous hymns express such lofty and seemingly impossible ideals of spiritual experience that we find it hard to take them literally, but if we know enough about the biographical circumstances of the author’s life, it turns out that they express what the author actually experienced. We can therefore assimilate them as expressing an ideal toward which we should aspire, not as something to belittle for supposed exaggeration. How do you envision readers using your anthology? My book is like other literary anthologies of devotional poetry. There is no shortage of literary technique to admire in hymnic poems, so readers can use the book for literary enjoyment. The accompanying explications will seem like to a return to the high school or college literature classroom. But the poems are devotional in content, so they can as well be read for devotional purposes, with the explications serving to enhance the devotional nature of the reading experience.